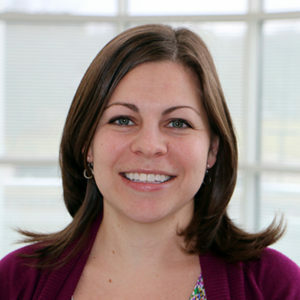 Christie Turcott, MS, CGC, is a clinical genetic counselor in the Medical Genetics and Down Syndrome Clinics. She is part of the Genetics Systems Integration Hub, which promotes the integration of genetics education and services throughout Wisconsin. Since 2008, Turcott has worked in pediatric genetics seeing patients with neurodevelopmental disabilities, birth defects, connective tissue disorders and inborn errors of metabolism. Her clinical areas of interest include Down syndrome, presymptomatic Huntington disease testing, Prader-Willi syndrome and Angelman syndrome. Couser NL, Pande CK, Turcott CM, Spector EB, Aylsworth AS, Powell CM. (2017). Mild achondroplasia/hypochondroplasia with acanthosis nigricans, normal development, and a p.Ser348Cys FGFR3 mutation. American Journal of Medical Genetics A, 173(4):1097-1101. Montgomery ND, Turcott CM, Tepperberg JH, McDonald MT, Aylsworth AS. (2013). A 137-kb deletion within the Potocki-Shaffer syndrome interval on chromosome 11p11.2 associated with developmental delay and hypotonia. American Journal of Medical Genetics Part A. 161A:198-202. Vatta M, Tennison MB, Aylsworth AS, Turcott CM, Guerra MP, Eng CM, Yang Y. (2012). A novel STXBP1 mutation causes focal seizures with neonatal onset. Journal of Child Neurology. 2012;27(6):811-4. Johnson SC, Marshall DJ, Harms G, Miller CM, Sherrill CB, Beaty EL, et al. (2004). Multiplexed genetic analysis using an expanded genetic alphabet. Clinical Chemistry 50:2019-27.